Machine-DRO History - A division of The Allendale Group, a family run British company founded in 2003. Our roots are firmly based in the UK, with a head office, engineering and inspection department at our works in Hoddesdon, Hertfordshire. We pride ourselves on being a measuring tool specialists offering tools, services, advice and expertise to our end customers and international distributor network. Included with the Digital Caliper - Battery, instructions and storage case. Key Specifications Measuring Range - 0-150mm (0-6 inch).Resolution - 0.01mm (0.0005 inch).Battery - 1.5V SR44.Display Height - 7mm.Pin Diameter - 2mm.Pin Length - 5mm.Jaw Depth - 41mm (1 5/8 inch).Working Temperature - 0 -40C. The display can also be set to zero at any position. Precision Round Pin Jaw - 2mm diameter by 5mm long round pin. Hardened Stainless Steel Construction - Precision ground and hardened measuring surface and slide. 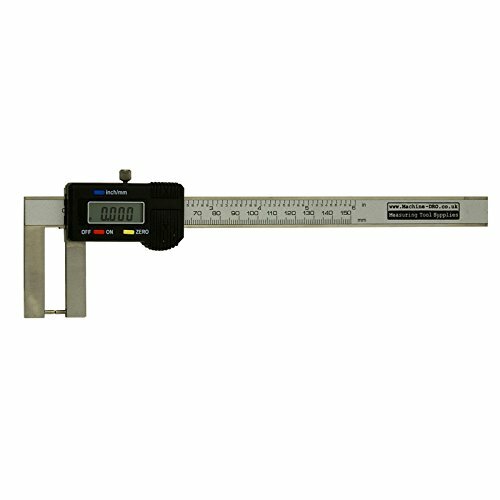 Metric or Inch Display - Direct conversion between metric and imperial display. Applications include measuring external recesses, circle grooves and stepped work piece. If you have any questions about this product by Machine DRO, contact us by completing and submitting the form below. If you are looking for a specif part number, please include it with your message.